This is a good interview that originally aired on Coast to Coast Radio. 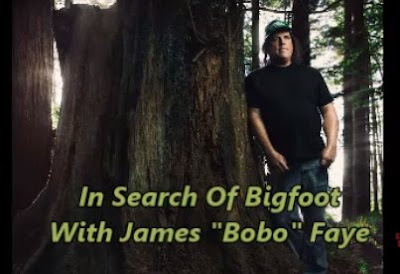 Bobo is a really likable guy and is probably my favorite character on Finding Bigfoot. Who is your favorite? James Fay, or Bobo, was born and raised in Manhattan Beach, California, and has been interested in the Bigfoot mystery for as long as he can remember. As a teen, he became an avid surfer, a skill set he would eventually use to investigate reported Bigfoot sightings in remote areas of the country. While in college, Bobo spent his downtime in the woods attempting to locate a Bigfoot. Following college, he took logging jobs on Native American crews to absorb their knowledge of the sasquatch legend. In addition, he increased his Bigfoot knowledge by taking jobs building roads and commercially fishing in Northern California. Bobo says that he saw his first sasquatch while on an investigation with veteran Bigfoot researcher John Freitas in 2001. Since his initial sighting, Bobo claims to have glimpsed Bigfoots on a few other occasions, but it was this first visual sighting that moved him the most. I noticed on last finding Bigfoot on the after show(1/17/16)when Bo-Bo was asked about his least favorite town hall they showed the clip. And in that clip I noticed Bo-Bo lost weight compared to that old video footage! Just throwing that out there that James Fey has lost some weight! Good Job Bo-Bo! Just visited the Bigfoot museum in Fenton CA and was talking to Mike Rugg, owner and proprietor of the Bigfoot Museum, and he said that Bobo was poisoned by a fan that sent him cookies to his hotel at one of the shoots.